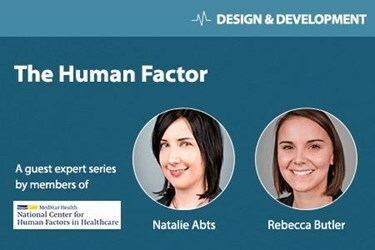 When incorporating human factors into medical device development, conducting user testing and gathering feedback from the device’s target end users is critical. To do this properly, the end user groups must be appropriately defined. In the FDA’s guidance on applying human factors and usability engineering to medical device design, the Agency recommends considering a variety of factors in user identification, including education and skills, literacy level, cognitive and physical limitations, and medical conditions or comorbidities. Many of these factors are especially important when designing for lay users, who have limited knowledge and capabilities compared to users with medical expertise. However, devices often are designed and evaluated with only the ideal user in mind. Although the FDA may accept validating the product with an ideal user population, taking this route can result not only in poor usability for a portion of the actual users, but also in severely limited marketability if users with limitations cannot operate it successfully. For example, 40-45 percent of diabetics have some degree of diabetic retinopathy, but devices intended for diabetes treatment are not always designed to accommodate low-vision users. To truly optimize design, principles of universal design and accessibility should be considered to accommodate a larger range of users. Here are some ways to incorporate these principles into human factors activities for lay user devices. Heuristic evaluation is a simple technique whereby a design is evaluated with respect to human factors principles. This method often is used early in the design process to identify usability problems and to generate solutions that reduce or eliminate the probability of use error. Commonly used sets of heuristics include Nielsen’s 10 usability heuristics for user interface design and the 14 Nielsen-Shneiderman heuristics for evaluating medical devices. While many usability problems can be detected utilizing these heuristics, some important issues may go unnoticed if the evaluation is conducted solely through the lens of an ideal user. For example, consider a glucometer that shows an on-screen progress bar while the system analyzes the user’s blood sugar. Typical heuristics advise that the user should always be aware of the current state of the system. Through the perspective of an ideal user, the progress bar may achieve this goal. However, if you consider the target user population of people with diabetes, we would expect that some users would have diabetic retinopathy. If the progress of the system is not perceivable by users who have vision impairments, the design violates human factors heuristics. Although heuristic assessments can take accessible design into consideration, the onus typically is on the evaluator to consciously apply these concepts for users of all abilities. These principles, developed by North Carolina State University, promote the creation of products that aim to be usable by everyone. While frequently used usability heuristics echo many of the criteria addressed in these principles, these guidelines are specifically designed to keep the abilities of all users at the forefront of the evaluation. For example, the principle of low physical effort is a key consideration in addressing common characteristics of an elderly population, or the weakening of muscles associated with certain disease states. Although this principle may be tangentially related to the aforementioned usability heuristics, physical effort is not specifically included. Thus, to capture all usability problems related to physical effort, the evaluator would need to remain cognizant of this issue when utilizing the commonly known heuristics as a standalone tool. Applying the principles of universal design as a supplement to these heuristics, however, provides more direct guidance to evaluators in considering the range of user needs. Formally incorporating the Universal Design Principles into a heuristic evaluation can transform this simple technique into a more robust tool for identifying usability problems and creating effective solutions for a larger portion of end-users. Another way to consider universal design during the development process is to factor characteristics of users with disabilities into risk analysis. To meet the FDA’s human factors expectations, a Failure Modes and Effects Analysis of usage is an ideal tool for identifying user tasks associated with high-risk outcomes (also referred to as critical tasks). This method takes all tasks associated with device operation and identifies how each task could go wrong (failure modes) and the potential consequences of each use failure (failure effects). Assembling a risk analysis with all users in mind provides an opportunity to identify whether there are any critical failure modes (or causes of those failure modes) that are more likely to occur, or could result in more severe consequences for users with disabilities or other characteristics commonly associated with your target user population. As an example, consider a new device that is intended for self-treatment by patients with a variety of conditions, including Parkinson’s disease. Symptoms of Parkinson’s, such as muscle stiffness and tremors, could introduce difficulty in completing tasks that require small manipulations or the application of force. Imagine that the new device requires a user to activate a switch, in the middle of the treatment process, to provide the final dose of medication. Although any user could inadvertently omit this task, a switch that is difficult to manipulate could cause users with physical limitations to be unable to complete it. While the average user could recover from their omission and complete the treatment, a user who is prevented from proceeding and is stuck mid-treatment for an indefinite period of time could suffer more severe failure effects. In this example, both severity of the failure effect and likelihood of error occurrence may be increased by considering patients with physical disabilities. Although the FDA does not take probability of error occurrence into consideration when classifying tasks as critical, they are looking to ensure the design reduces the probability of critical error to the furthest extent reasonable or possible. Failing to address the influence of atypical use on the likelihood of critical error may lead to a suboptimal design, or the erroneous belief that the error mitigation strategies in place will be acceptable. Because optimizing design to mitigate critical error is a primary FDA concern when reviewing human factors data, taking a more inclusive approach to risk analysis could help to make this case. Accessible design and the range of applicable users also should be considered once the device is ready for formal user testing. Because device manufacturers often want to see successful testing results at every stage of evaluation, it may be tempting to utilize study participants who are the most likely to use a device correctly and/or with little difficulty. However, gathering data from users outside of the average can be vital in maximizing usability, particularly during the formative evaluation stages, when the device design is still malleable. Study outcomes should not have the expectation of perfection in the formative stage, so developers should not be afraid to run testing that will expose device weaknesses. Thus, including users with disabilities or comorbidities that affect correct usage should be welcomed. While it may not be realistic to represent all possible end-users during testing, inclusion of participants with a variety of capabilities should be considered to make the most out of iterative development. Once you have decided to incorporate a wider range of users into formative testing, you can derive a host of valuable insights by observing those users interact with the device during task performance. Although you may find that users with common comorbidities operate the device in the same way as other users, it is also possible to uncover unexpected usage differences. For example, users who have had a stroke may be forced to creatively manipulate certain components of the device to accommodate use of only one hand, or perhaps users with low vision will need to pick up a device meant to remain stationary to facilitate viewing the screen. Discovering these usage differences early in the design process gives you the opportunity to implement fixes that create a more universal design. Some of these modifications could be as simple as making two components snap together more easily, or increasing the font size on the screen. For instances in which you discover an accessibility issue with your device that is not a simple fix, you also can build in time to correct these problems, before the design is finalized. Gathering this type of usage data in the formative stages not only leads to a more optimized design, but it can better prepare you for the results you’ll see in validation testing. Without collecting formative data with the full range of potential users, it is far more likely that performance difficulties will go undiscovered until validation testing begins. If results are poor, the time and cost needed for redesign will be prohibitive. Additionally, including a wider range of users in formative testing can impact important details of the study plan, including selection of testing scenarios, identification of critical tasks, and makeup of user groups. If the formative data shows that certain user characteristics lead to substantial differences in device understanding or the way users approach task completion, it is possible that you may need to include a completely separate group of users in the validation study to represent user diversity. Although this determination should be made in consultation with the FDA and may vary from product to product, seeing these formative results could help you to make that decision sooner. Medical device users, particularly lay users, have a wide variety of characteristics, and it may not always be reasonable or practical to accommodate the unique abilities of every person. However, identifying characteristics that could affect the design early in the design process and integrating distinct user needs into development leads to a more universally usable product. In a competitive market, usability can be a determining factor in device success. By using the techniques described above, manufacturers can improve design and put themselves one step ahead in making devices widely accepted and easy to use for their entire user population. Natalie is the Senior Program Manager for the Usability Services division of the National Center for Human Factors in Healthcare. She manages the technical and quality aspects of usability projects conducted both for the medical device industry and within MedStar Health. Natalie has specialized experience in planning and executing both formative stage usability evaluations and validation studies for medical devices and combination products on the FDA approval pathway. She also leads an initiative to incorporate usability testing into the medical device procurement process in the MedStar Health system, and is active in delivering educational presentations to the medical device industry and other special interest groups. Natalie holds a master’s degree in industrial engineering, with a focus on human factors and ergonomics, from the University of Wisconsin, where she was mentored by Dr. Ben-Tzion Karsh. Rebecca is a Usability Specialists at the National Center for Human Factors in Healthcare, where she is responsible for leading usability evaluations of medical devices from the initial test preparation to the final report submission. The majority of her time is spent conducting formative and validation activities for external clients who are seeking FDA approval for their products. Rebecca also provides support on usability related consults within the MedStar Health system, with an increasing focus on patient safety events. Before joining MedStar, Rebecca gained extensive experience working with adults with physical and sensory disabilities as an assistive technology trainer. In particular, she specialized in teaching individuals how to use text-to-speech and voice recognition software to succeed in the modern workplace. Rebecca holds a bachelor’s degree in industrial and systems engineering from Virginia Tech and is currently pursuing a master’s degree in psychology, with a concentration in human factors and applied cognition, from George Mason University.